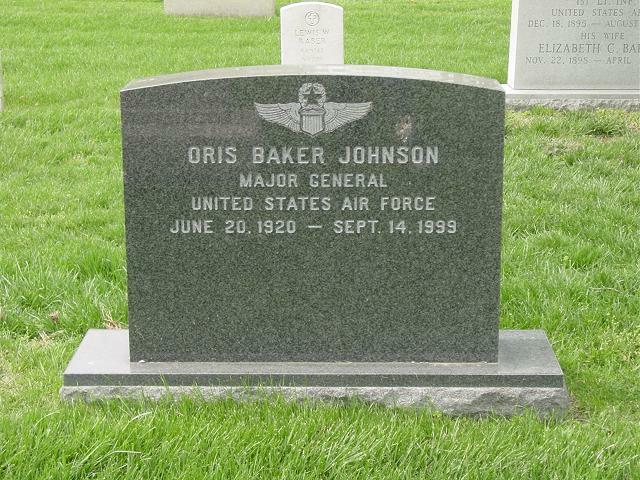 Major General Oris B. Johnson was deputy chief of staff, materiel, Headquarters Aerospace Defense Command, Ent Air Force Base, Colorado. General Johnson was born in Ashland, Louisiana, in 1920. He graduated from high school in Natchitoches, Lousiana, in 1935 and entered Louisiana State Normal College where he majored in chemistry and physics. After receiving his bachelor of science degree in 1939, he taught for one year in Mer Rouge, Louisiana. He entered the Army Air Corps as an aviation cadet in November 1940 and received pilot training at Tulsa, Oklahoma, and Randolph and Kelly Fields, Texas. In July 1941 he graduated with his pilot wings and commission as Second Lieutenant. He then served as a pilot at several air bases in the United States. During World War II, from October 1943 to September 1945, General Johnson was commander of the 422d Night Fighter Squadron in the European Theater of Operations. After the war he was assigned to the Tactical Air Command, and in July 1946 was transferred to Langley Air Force Base, Virginia. General Johnson was assigned in August 1947 to Headquarters U.S. Air Force, Washington, D.C., in the Office of the Deputy Chief of Staff, Operations, where he served in the Fighter Branch and later as chief of the Air Defense Division. During the Korean War in April 1951, he was assigned to Headquarters Far East Air Forces in Tokyo, Japan, and became director of requirements, Directorate of Operations. General Johnson returned to the United States in October 1953 to begin a series of assignments with Aerospace Defense Command (then Air Defense Command). He assumed command of the 501st Air Defense Group at O'Hare International Airport, Chicago, Ill. In January 1956 he was assigned to Air Defense Command Headquarters at Ent Air Force Base, Colo., where he served initially as chairman of the Distant Early Warning Operations Warning Group and then as special assistant to the deputy for operations. December 1960 with Headquarters U.S. Air Forces in Europe, Wiesbaden, Germany. During this tour of duty he served as the assistant deputy chief of staff for operations. In August 1963 he returned to the United States as commander of the Washington Air Defense Sector based at Fort Lee, Va. In February 1966 General Johnson returned to Ent Air Force Base as director of operations for North American Air Defense and Continental Air Defense Command and in August 1966 he assumed command of the 9th Aerospace Defense Division, ADC. The division became the Fourteenth Aerospace Force in July 1968. He became commander of the 313th Air Division, with headquarters at Kadena Air Base, Okinawa, in August 1969. General Johnson again was assigned to Aerospace Defense Command in September 1971 in the position of deputy chief of staff materiel, Aerospace Defense Command. French Croix de Guerre with star, and the Belgian Fourragere. General Johnson's hometown is Ashland, Louisiana. He was promoted to the temporary grade of Major General effective August 1, 1966, with date of rank July 1, 1961.